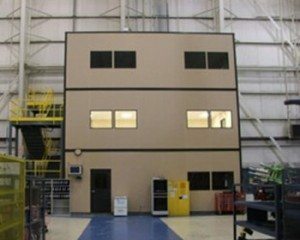 With a tailored design for your modular office within your plant area, Panel Built can maximize efficiency and pick a location that works the best for the flow of activity and convenience to your workers and supervisors alike. Modular inplant office setups give you the opportunity to make maximum use of proximity, in order to place this workspace where it will provide the best overall point of contact for your employees. 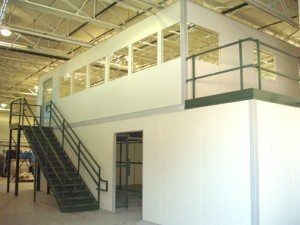 Whether you need a modular space on the main floor or upstairs on a mezzanine, we can help you design and put the modular structure where you want it with surrounding necessities nearby to offer a safe, well lit space. Whether setting up a well-built central facility for engineering, greeting visitors, or both we can help you select and erect the perfect facility within your plant or warehouse for a one or multi-story need. Whatever the requirement, our world-class engineers can assist you with the thought process and design, and we will stand behind each installation of our modular designs. Your Panel Built modular office will be the top of the line, and be a major focal point of your business for years to come. Using polystyrene panels, with binder post systems that are powder coated, ensures that your modular structure will be sturdy and stable, standing the test of time, with provisions within the panel for phone, data, and electrical pathways. Honeycomb panels with divider strips that match offers a very conventional look, yet is very easy to install. Phone, electric, and data lines also can be placed anywhere in the panel. The versatility of all the Panel Built wall panels gives you the choice of many wall designs and finishes. A choice of a resin-impregnated honeycomb core, or expanded polystyrene offers all the strength needed, yet all the flexibility in design that is required as well. Included is a strong fire rated safety barrier constructed with steel studs and mineral wool. All of the modular systems provided by Panel Built offer limitless surfaces, designed to fit whatever overall scheme your plant requires. The most popular Panel Built surface is a ½ “ drywall panel that is vinyl covered, which is ideal for fire protection, sound protection and overall cost. Also utilized is aluminum, hardboard, steel, hardboard, plywood, reinforced plastic (FRP) porcelainized steel, and basically any manner of surface that can be laminated. The Panel Built system is the most versatile that anyone will find in the industry, as we can supply you with any “off the shelf” configuration, 8’ X 10’ structure to within a tolerance of ¼”. This gives you all the flexibility that you need for your Panel Built modular office. Whenever you have unlimited choice in just how to choose a design or project, it becomes difficult to sift through all the different decisions that present themselves. That is why at Panel Built, we have our selection guides that feature our Panel Rating Guides, the Building Application Guide, our Office Performance Series, and the High Performance Series. These guides serve to point you in the right direction and give you some configuration help in planning from the start. You should also take a look at our Panel Built Catalog as well as our on-line video, which is packed full of some our most popular and famous projects. You will be amazed at the different and divergent designs that really stand out in any plant or warehouse facility. Color is a big deal with us and you have a wide range of colors from which to choose, to fit your scheme of things. We assume that after you spend time with our people and you see the quality and dedication that we put into each project, you will see the advantage of a Panel Built modular office for your business. We can point to hundreds of our customers who have chosen to do business with Panel Built. They will tell you that the modular structures that they have purchased from us are still giving them the sturdy service that provides the functions they need on an ongoing basis. For more information, please, click here.